The SAGEON Micro 200 amp DC power system delivers the unmatched capability of a full size SAGEON Power System in a compact and cost effective solution. Designed to deliver up to 200 amps of power for 24 volt or 48 volt systems, the Micro Power Module provides the flexibility to put power where it is needed. 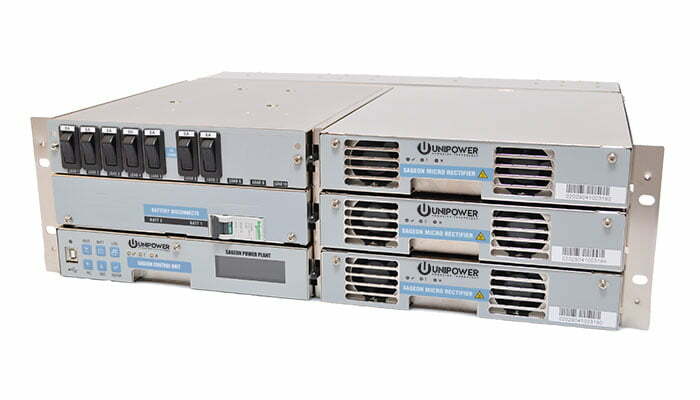 The Micro Power Module also offers the flexibility to configure the best solution for your needs with options including integrated battery disconnects and load distribution; all in space saving configurations from two through seven rack units. The SAGEON Micro 200 amp DC power system consists of a power frame that includes the SAGEON Controller, mechanical mounting for up to seven SAGEON Micro Rectifiers, all inter-system cabling, and optional items including AC input breakers, battery disconnects, DC distribution breakers and fuses, and remote communications – all factory installed and tested. Installation cost and time are minimized because there is only one component to install. To complete your system simply connect your AC and DC cables, plug-in the SAGEON Micro Rectifiers, and you are ready to go. In addition to the basic control functions, the SAGEON Micro 200 amp DC power system supports all of the advanced functionality available in a SAGEON Power System including; remote monitor and control, battery testing, individual cell monitoring, programmable battery recharge current, and site monitoring. Varies by rectifier model. See the rectifier brochures for more information.